In case you missed the recent STEMconnector townhall on “Leveraging Game-based Learning to Increase STEM Engagement,” here are 11 lessons we learned from the teachers, students, game-designers, philanthropists and experts who participated. Becky Renegar, who specializes in gifted education in Piqua Central Intermediate School in Piqua, Ohio, extolled the benefits of using online games to provide challenges for her above-grade level students. Additionally, groups of her students developed their own games in the National K-12 Game-a-thon, which provided rich opportunities for advancing their mathematical skills. Incorporating game-based learning into her math program helped teacher Shannon Duncan at McPherson Magnet School eliminate the word “failure” from her class. “Real failure is simply in the never trying,” she said. Shannon Duncan described using Minecraft to ask a student this question: How would you use blocks to build the White House in Minecraft? 8. Don’t just play games – create your own! For examples of student-created math games including board games, card games, floor mats, and computer programs, view the National K-12 Game-a-thon’s Hall of Fame. From the delightfully precocious home-schooled six-year-old who loves games so much that he codes his own to the father of grown children who’s written the book on gaming – everyone in the Townhall had experienced true joy and delight with educational games. Twelve-year-old New Jersey student Jemma, who created the game Crop Computation in last year’s Game-a-thon, said she’s interested in a career in biology or computer science, yet her favorite subject is English. Would it be okay to go to college and double major in math and something like Russian literature, she wondered aloud? But MIND’s Nigel Nisbet told her not to worry: CEO and co-founder of MIND Research Institute, Matthew Peterson, triple majored in Chinese literature and language, biology and engineering. After all, college -- like game-based learning -- is what you make of it. Christine Byrd is a communications manager for MIND Research Institute, and parent of two game-loving kids. Greg Gage (and lab partner Tim Marzullo) started Backyard Brains in order to design affordable equipment to help students learn and participate in neuroscientific discovery. I had the privilege of meeting their assorted band of science geeks and committed educators at this year's NSTA conference, and was connected by electrodes to a skeptical and wary teacher in exactly the way they demonstrate in this TED talk demonstration. 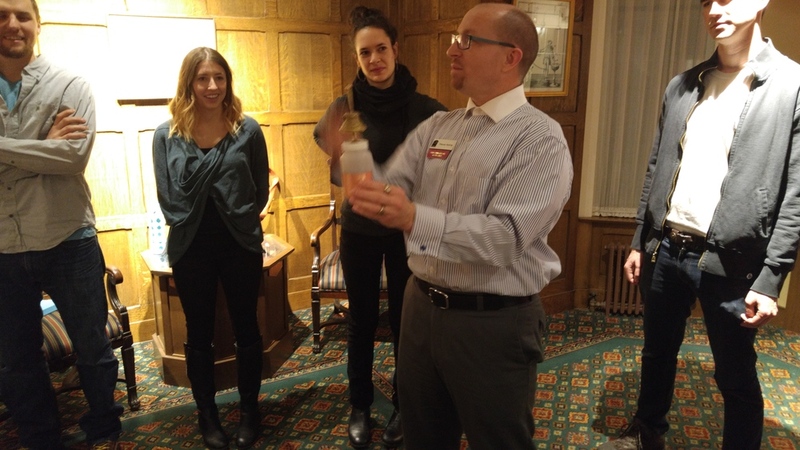 If they are exhibiting at a conference you attend, make sure you stop by for a fun and fascinating hands-on learning experience. It’s the scene of a crime, set in some indeterminate time in the future. Forensic experts, computer experts, and scientists fill the scene. You are one of them. Your job is to gather clues and recover data from a top-secret research project that somehow goes wrong. It sounds like the plot of a movie. But in fact, it’s a game called Max5 and it’s another example of games being used in education, this time, for teaching science, technology, engineering, and mathematics – the so-called “STEM” fields. The education aspect of Max5 comes from its use of concepts in processing, visualizing, and analyzing biological data to teach about bioinformatics. The game simulates scientific IT tools, such as the Basic Local Alignment Search Tool, also called BLAST, to find DNA sequence matches in a database. The game also teaches players to manage computer resources. Max5 comes from the Human Centered Design and Engineering Department, a research group at the University of Washington that develops games intended to help prepare students for science and engineering degrees and careers. Game developers say that they want to encourage cyber problem solving in students, particularly in underrepresented minorities and women. Male and female high school students participated in all aspects of game development, even contributing some programming code. “We found that many of the unique elements of the game and our focus on integrating different styles of play resulted from this unique collaboration with the teenagers,” the developers explain in a grant project report. The game’s development was funded in part by a grant from the National Science Foundation. Developers say that the game could help reverse declining student interest in the STEM fields. Also, the game could help shore up science education at a time of shrinking school budgets that cut into support for science education. Those declining resources make it difficult for teachers to give students on-on-one time. The advantage of Max5 is that the game can engage students in scientific concepts without needing a teacher present. Last fall we started work on our next generation of iNeuron. The first version of the game had enjoyed an enthusiastic reception from teachers, we had collected important feedback on content and user experience from our initial round of classroom research, Apple had released a new development environment for the iPad, and we had been successfully awarded Phase II SBIR funding from the NIH. Initial classroom testing commences later this spring and will continue in earnest through the summer and into the new school year. At the same time we began thinking about our next educational game. What comes after iNeuron? We started brainstorming about different STEM subjects where we could turn our focus. The conversation included how best to meet the needs of the underserved high school market, which subjects would be most amenable to our collaborative mobile-game approach, and what concepts are both critical to learn and most challenging to cover from an instructional standpoint. 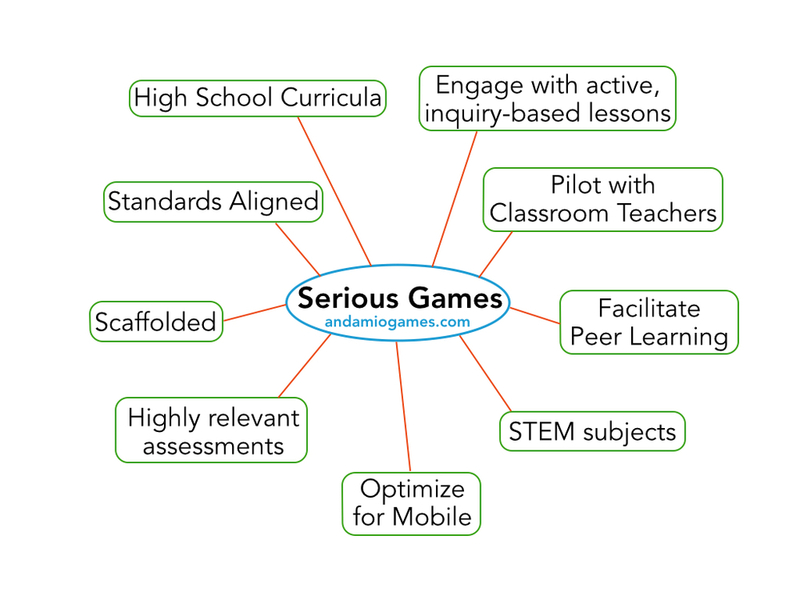 Being the newest member of the team, and getting ready to meet with teachers who I was going to try to convince to download and play iNeuron, I had to ask the question from the teachers’ perspective: How do mobile device games make sense in the science classroom? Asking this question wasn't just an academic exercise. It is no small feat creating any curriculum that is engaging, educationally effective, affordable to cash-strapped school districts, and easily adopted and implemented by teachers. We know that teachers are quickly adopting mobile devices, and we know that mobile devices can engage and inform in ways that other kinds of curriculum delivery can't. But what specifically will make our mobile games work in ways that other kinds of teaching don't? Build for Secondary Students: Design a high school curriculum that also challenges first year college students and is within reach of industrious middle schoolers. Align with Standards: Enable teachers to hit state and nationally prescribed learning targets. Scaffold the Instruction: Promote mastery and deeper long-term learning with appropriate supports and carefully timed encouragement. Test with Feedback: Reinforce new knowledge and bolster long-term retention with high-frequency, low-stakes quizzes. Increase Student Engagement: Promote active, inquiry-based learning with a problem solving approach that leaves strategy and timing open-ended. Pilot with Teachers: Limit instructional overhead by incorporating teacher feedback into the design. Leverage Opportunities for Collaboration: At every moment facilitate the best possible peer learning. Focus on STEM Games: Stick to our core expertise, and foster curiosity in science through a hands-on, constructivist approach. In the coming blogposts, we hope to start a conversation with you as we delve into some of these ingredients in more detail. We have our own ideas about what makes a really effective learning game, and teachers' enthusiastic response to iNeuron suggests we might be doing some things right. But we're smart enough to know that we don't know everything. That's why we want to hear from you -- classroom teachers, home educators, administrators and students. In your experience, what's the best possible use of learning games in education? What makes mobile ed-tech worth having? Carol Dweck discussing her brain research at Stanford: "As neuroscience reveals the working of neurons, and the plasticity of the brain, our research reveals the importance of these concepts for student motivation and achievement." Thanks to the generous support of our Kickstarter project backers, we were able to produce a version of iNeuron that was available through the iTunes store in time for the 2013-2014 school year. This enthusiastic support has also energized the Andamio team in our pursuit of new approaches to STEM education.